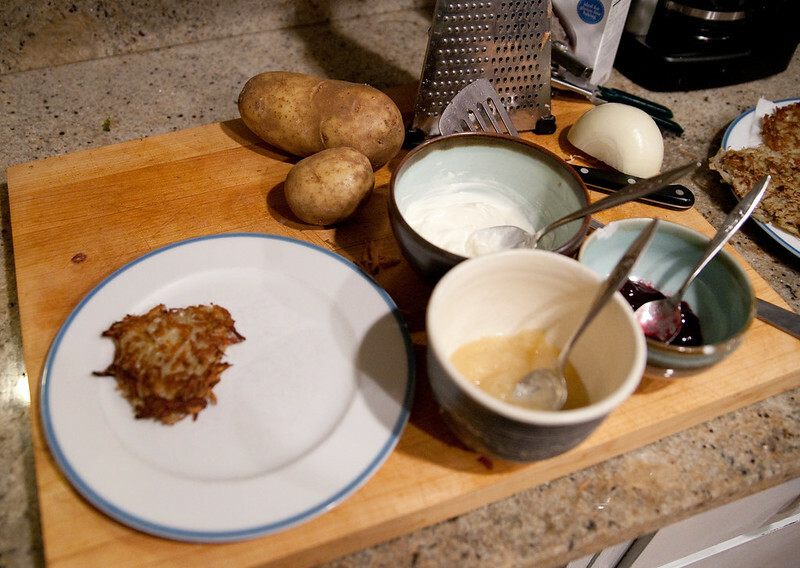 One of our favorite Hanukkah traditions is making latkes. Food made with excessive amounts of oil is common in Hanukkah –the cooking oil symbolizes how the one vial of oil that was only supposed to last one night lasted eight. 1. Start heating the frying pan. 2. Grate the potatoes and onion. 3. Squeeze all the excess liquid from the potatoes and onion. 4. Mix in 2 eggs and 2 tablespoons of flour. 5. 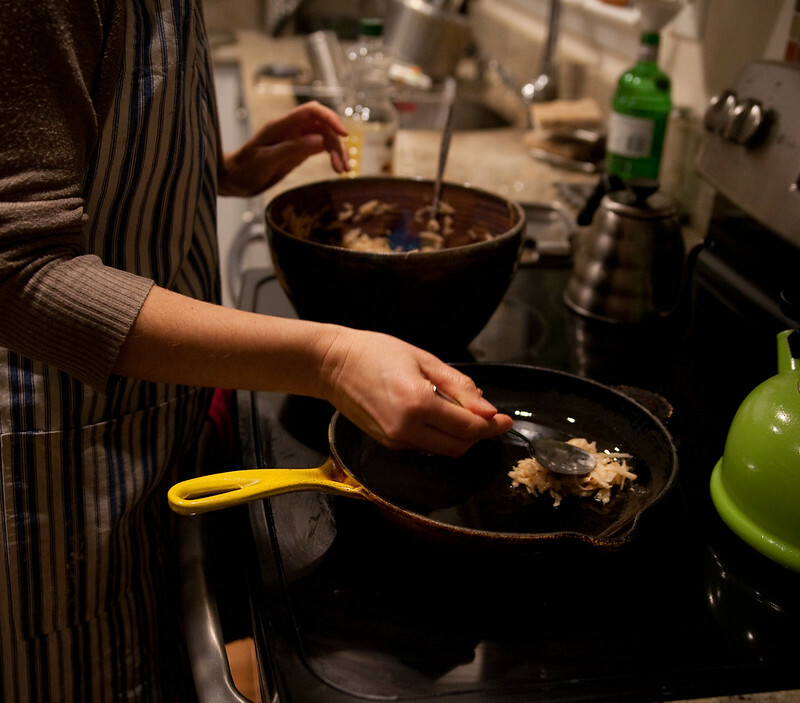 Check your frying pan to be sure that it is nice and hot and fill it full of about a quarter inch of oil. 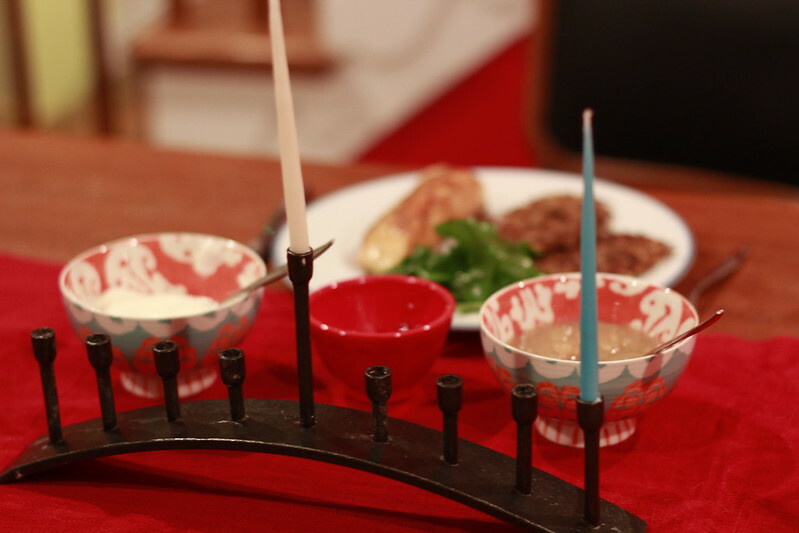 Hanukkah is all about oil – the whole point is to remember the Hanukkah miracle. I use olive oil, but you can use canola oil if you would like. 6. Form flat pancake patties with the potato mixture and add to the oil. 7. After 3-4 minutes, flip. 8. After frying both sides nice and crisp, let them cool on a paper towel. Or keep them warm in the oven as you make them. 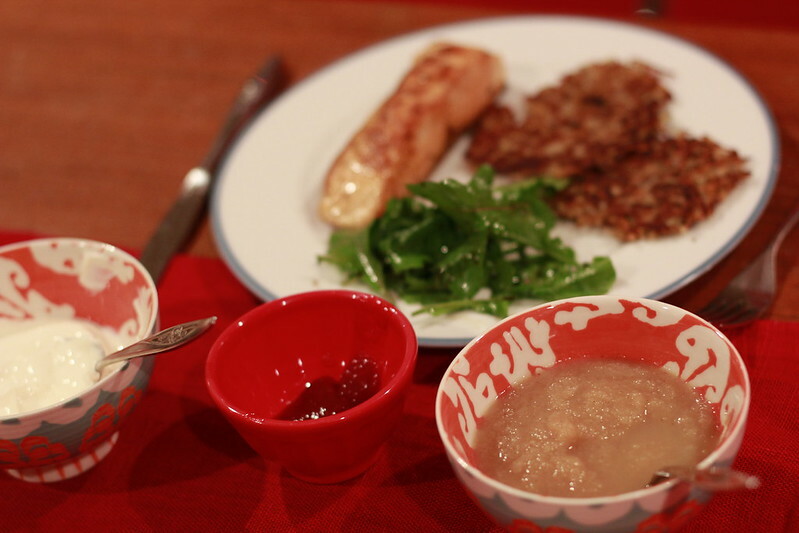 Serve with apple sauce, jam, and sour cream. 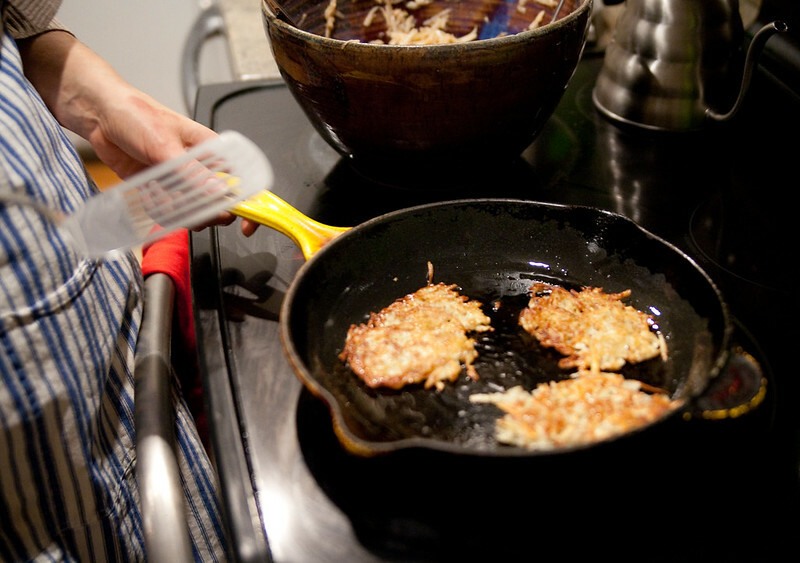 Latkes can be the entire meal or served as a side dish of fish or meat. 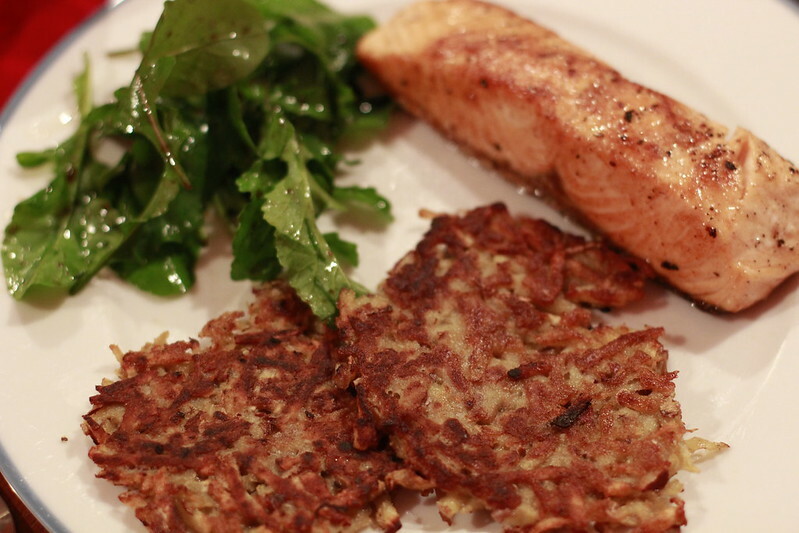 Here I served latkes with a piece of salmon and fresh arugula from my garden. Side note: You can use any type of potato you like. I like to use sweet potatoes, but my kids can be picky. This time, I added a Japanese sweet potato and they didn’t notice because it was white. It added an additional sweetness that I enjoy.